Would they like they direction surfing went? Today, there are over 23 million surfers worldwide. That population spans elite professionals, diehard beach bums, weekend warriors, and resort vacationers. International travel has never been easier; travelers are able to reach once near mythic locations in a matter of hours. Additionally, different forms of surfing have emerged in recent years, from stand up paddling to wake surfing, allowing, even more people to participate in the act of riding waves. The sudden emergences of wave pools have even given landlocked folks the ability to try their hand at surfing. With the recent leaps and bounds of advancements in surfing, it is easy to get caught up looking ahead to what the future holds, but we must not forget our roots. It is critical to take the occasional careful look back at the history as we continue to move forward. The act of riding waves is thousands of years old. It is difficult to pinpoint the exact origin of surfing in ancient Polynesia because it predates European contact. There’s even been recent discussions to consider if it was first practiced in Pre-Inca Peru. Prior to the arrival of the colonial European powers in Polynesia, surfing was practiced widely across Oceana—in Hawaii, Polynesia, New Guinea, even as far as New Zealand. However, in Hawaii, surfing played a particularly significant role in society. One can only imagine the awe experienced by the first European explorers as their gargantuan ships entered into the turquoise waters of Polynesia and they witnessed wave riding for the first time. European society as a whole looked at the ocean with fear and awe. From their perspective and experience, waves were the product of storm systems that caused shipwrecks, loss of life, loss of wealth, and loss of property. Yet in the clear waters of the Polynesian Island chain, the ocean was a playground, or perhaps a theater, and waves were a stage to those who gracefully danced on them. Naturally, surfing was met with shock, awe, and confusion by those European explorers. Eventually, this confusion and misunderstanding would evolve into disdain and resentment by the European colonists and missionaries. Captain James Cook, the famed British explorer who first landed in Australia, witnessed canoe surfing and bodysurfing in the Society Islands in 1777. He would later witness stand up surfing in the Hawaiian Islands in 1778. Captain Cook was captivated by surfing, and so were those who followed him: traders, missionaries, and journalists, most notably Mark Twain and Jack London. 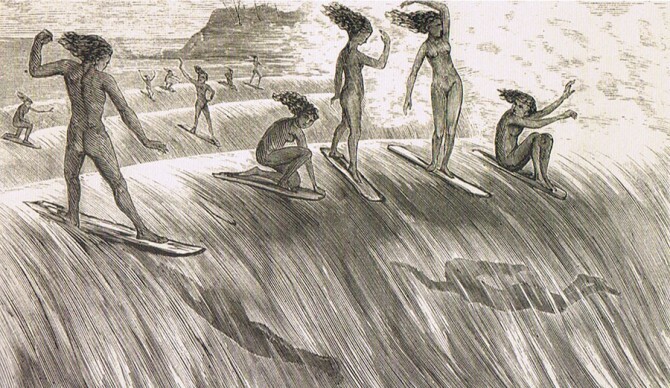 The fascination Europeans had would fade when they discovered how deep surfing was embedded in Hawaiian society. Surfing was more than just sport; it was largely associated with the native religious practices. The near worship of wave riding was in stark contrast with the Calvinist missionaries who had arrived in Hawaii in the 1820’s with the goal to bring Christianity to the Hawaiian Island chain. Hiram Bingham, the leader of the first missionary party in the Hawaiian Islands chronicled his ship’s encounter with surfing before they had even reached shore. Bingham writes, “The appearance of destitution, degradation, and barbarism, among the chattering and almost naked savages, whose heads and feet, and much of their sunburnt skins were bare, was appalling.” Seeing surfing as being at clear odds with a Christian life, Bringham and the missionaries that followed him, set out to oust surfing from Hawaiian society. During this early period of colonial settlement and missions in Hawaii, Hawaiian culture suffered and faced near extinction. The people of Hawaii had been devastated by European disease resulting in a crumbling native population. Between 1778 and 1893, the native population fell from three hundred thousand to under one hundred thousand. Twenty-seven years after Bingham’s arrival in Hawaii and his first written condemnation of surfing, Bingham wrote, “The decline and discontinuance of the use of the surfboard, as civilization advances, may be accounted for by the increase in modesty, industry or religion.” Surfing in Hawaii was nearly dead. Fortunately, surfing’s dance with near extinction was brief. A few faithful Hawaiian surfers managed to keep the sport alive during the height of European colonialism. And during the twentieth century, surfing experienced a complete renaissance. Thanks to now mythical figures, George Freeth and Duke Kahanamoku, surfing managed to find its way to the mainland USA and from there to the rest of the world and the twentieth century would bring about a golden age in surfing.